I love the red pepper & garlic bread recipe. 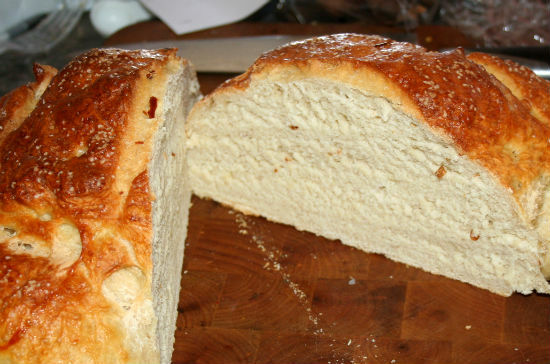 I have yet to make real bread in a dutch oven...this sounds like a great place to start. I am more of quick bread in cast iron skillet girl. Tweaked corn breads & traditional Irish soda bread (grandma didn't put raisins or caraway seeds in hers.) Love the fact that you TWEAK stuff... experimenting is my favorite way too cook!!!! My hat's off to you, too. I have NEVER been able to pull off a good soda bread. I don't know why. I always end up with a brick. Its all in the lack of kneading. Over time I've found that just a quick knead, a rough ball, throw it in a cast iron skillet and cut a cross in the top. I'll send you my recipe...just real basic...makes great toast with Irish butter & jam. Toss together dry ingredients. Add the buttermilk & stir briskly until it forms a rough, wet mass. Toss it out onto a very liberally floured surface(I don't care if the book says lightly...that just makes a mess! )Knead for 30 seconds...no more. Make a 7-8 inch round out of it & throw it in an 8" cast iron skillet. Cut a large cross in the top about 1/4" deep. Bake 45-50 mins or until nicely browned & the X has spread open. Transfer to a rack to cool, then wrap in a slightly damp tea towel & let rest for about 8 hours. Like I said, real basic. I don't know how you get such beautiful loaves! Mine just never turn out quite right. 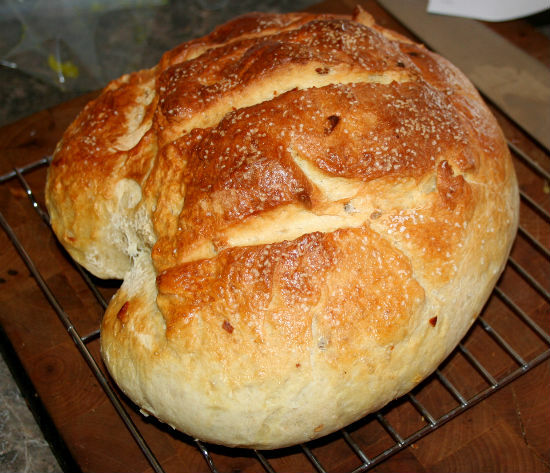 I'm experimenting with a pizza bread right now that has real potential but I'm afraid it won't look nearly as nice. Thank you, Toni! I don't know that I can put a finger on what magically makes a loaf of bread work out. I've made a lot of them that didn't. Maybe that's the magic, right? There are two things that made this one, in particular, come out looking so nicely. One is the egg wash. That always gives bread a nice brown shine. The other aspect is careful management of the heat. I'm still in the process of learning that, so it's tough to quantify and explain. Suffice to say, I've done it where I've added too much top heat, and it ends up too dark, or even borderline burned. Or, the crust is too hard. I think that it's important to have your dutch oven be very hot at first, and then as it bakes, you can let the heat off just a little. Like, it's OK if it starts at 400, or even higher, but then as it goes along, you can allow it to go to even 350. I'm not really sure of those numbers, I'm just kinda spouting off thoughts I've been having lately.